Advocacy organizations are viewed as actors motivated primarily by principled beliefs. 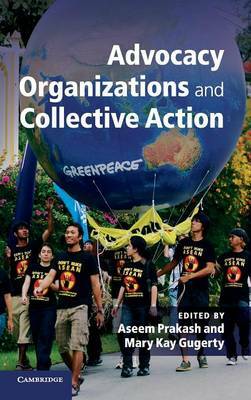 This volume outlines a new agenda for the study of advocacy organizations, proposing a model of NGOs as collective actors that seek to fulfil normative concerns and instrumental incentives, face collective action problems, and compete as well as collaborate with other advocacy actors. The analogy of the firm is a useful way of studying advocacy actors because individuals, via advocacy NGOs, make choices which are analytically similar to those that shareholders make in the context of firms. The authors view advocacy NGOs as special types of firms that make strategic choices in policy markets which, along with creating public goods, support organizational survival, visibility, and growth. Advocacy NGOs' strategy can therefore be understood as a response to opportunities to supply distinct advocacy products to well-defined constituencies, as well as a response to normative or principled concerns.